Nurture your kitten's natural greatness with Purina Pro Plan True Nature Natural Chicken & Liver Grain-Free Kitten Formula Canned Cat Food. This recipe contains multiple sources of protein, including real poultry, and carefully-chosen, purposeful ingredients. 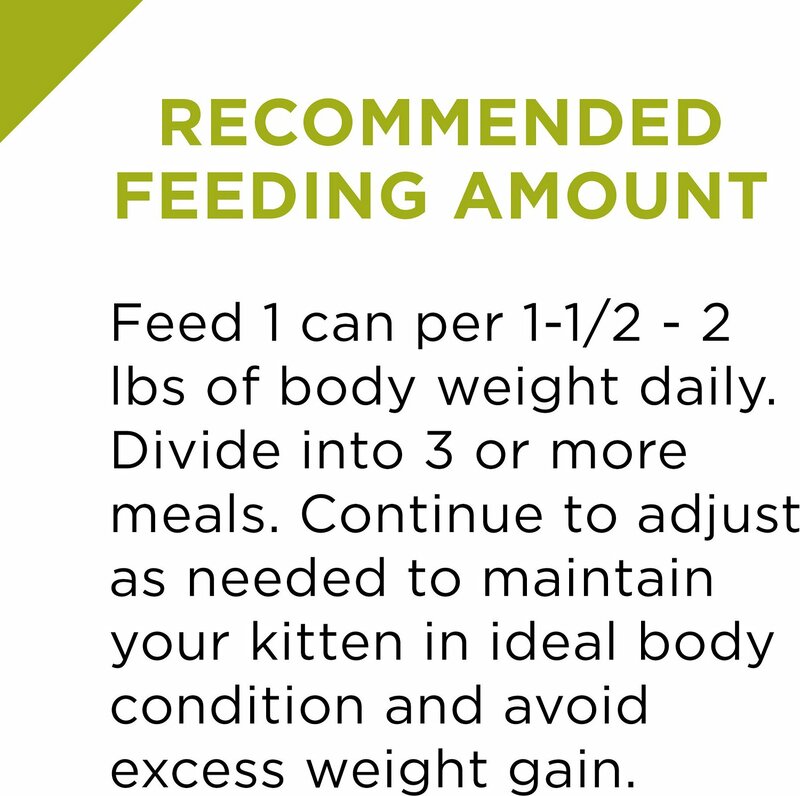 The tender bites are easy for your kitten to chew, while the delicious taste keeps her coming back to her dish at feeding time. It's a grain-free option without artificial colors, flavors or preservatives, so you can feel confident she's getting a wholesome meal. Make a wholesome food part of her daily feeding routine, and show your kitten just how important her health and happiness are to you. 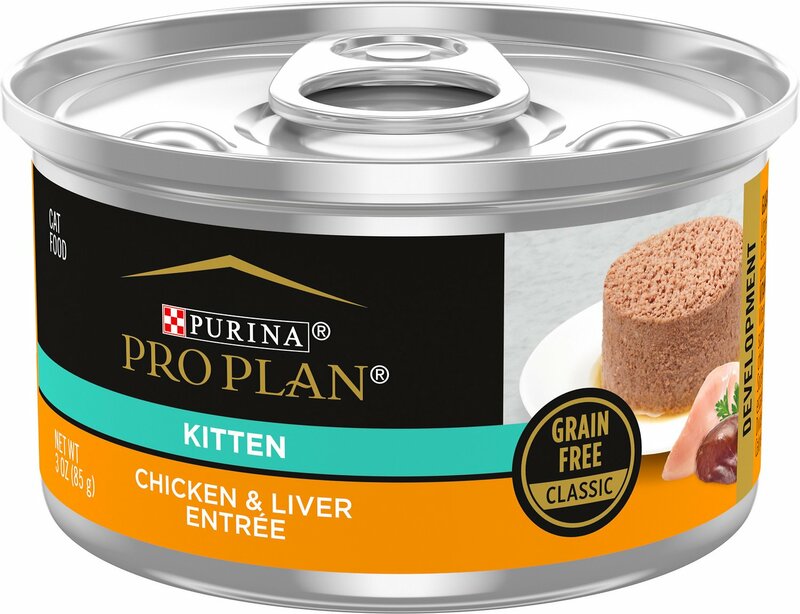 Made with high-quality protein, including real poultry, to nourish your growing kitten. Made from a grain-free recipe that you can feel good about serving to your little one. 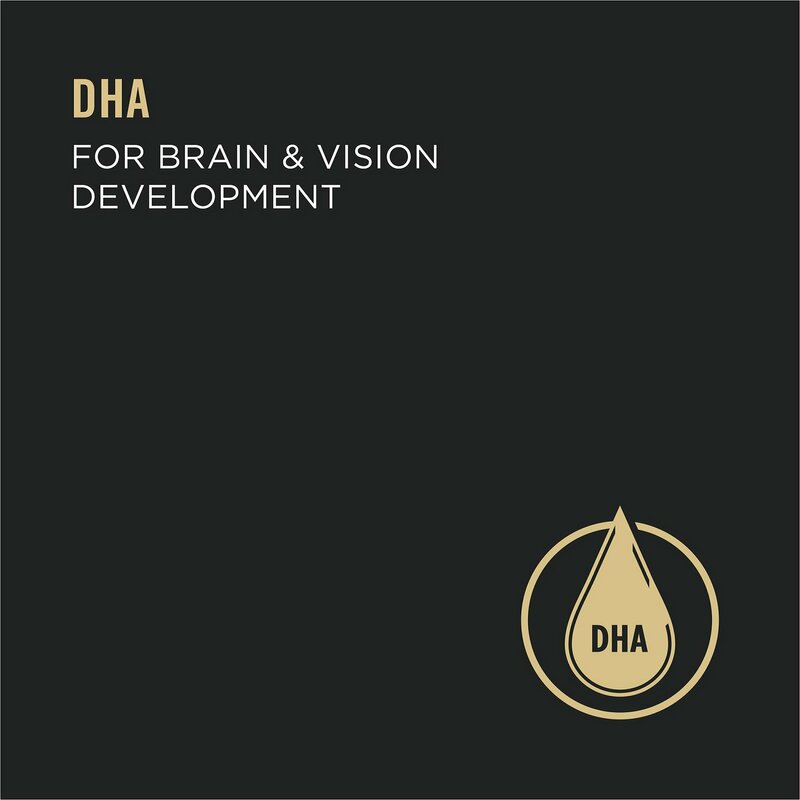 Features DHA to nourish vision and brain development during the most formidable year of a growing animal's life. 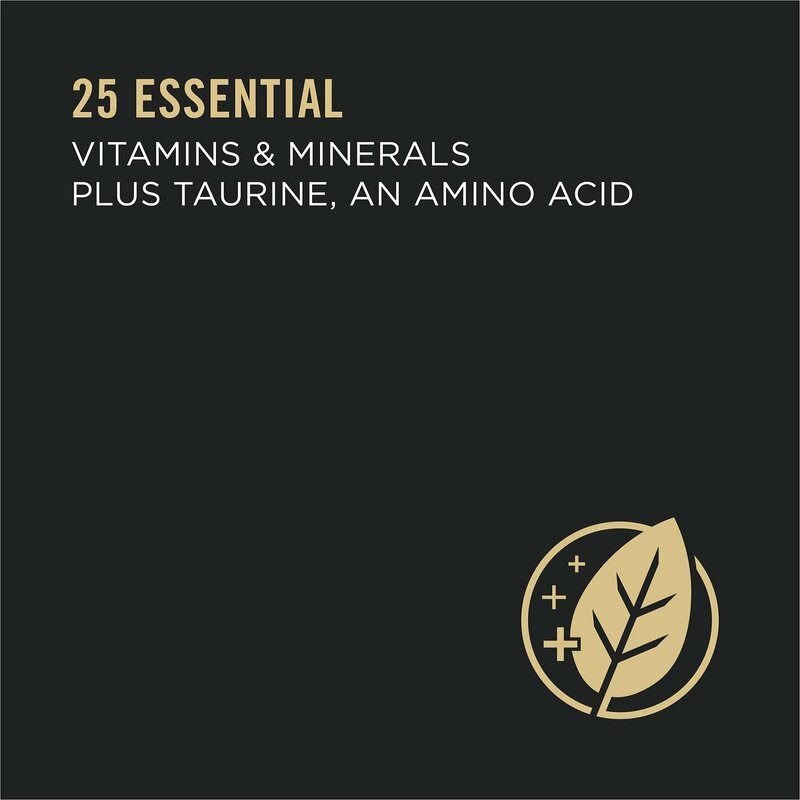 Formulated to meet the specific nutritional needs of growing kittens through the first year of life. 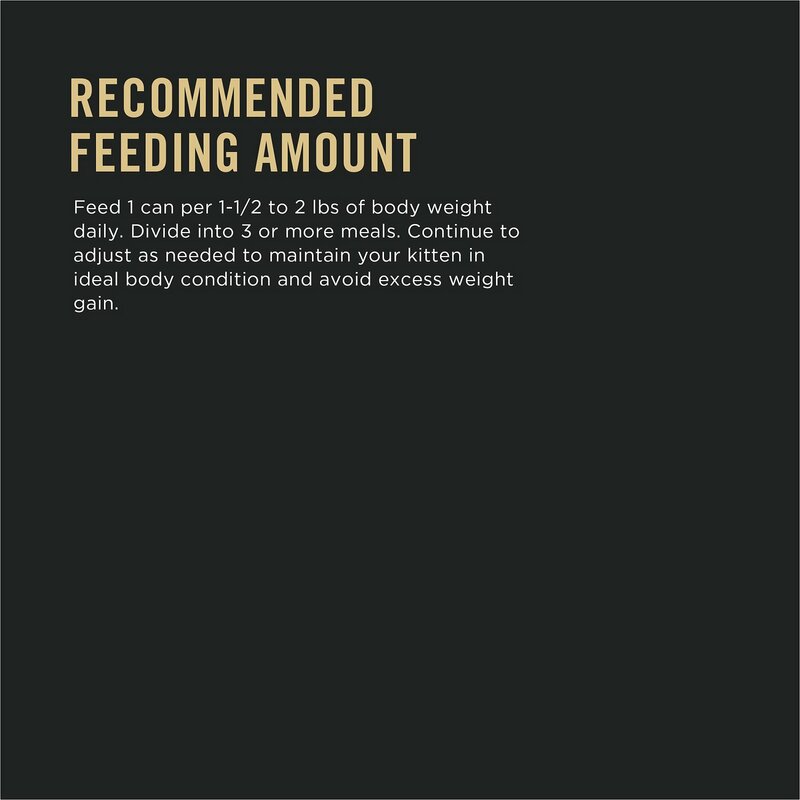 Feed 1 can per 1 1/2 - 2 lbs of body weight daily. Divide into 3 or more meals. Continue to adjust as needed to maintain your kitten in ideal body condition and avoid excess weight gain. I love the fact it's grain free . . I believe my 1 year old kitten loves the taste and smell. She has eaten it for her whole life with me. She is in great health, certified by her Dr.(her Veterinarian since she was 1 mouth old).She is at her ideal weight and very happy and active. Like a kitten would be. I love her very much and would always do and give her what is "right" for her good health and long long life. And it's grain free ! And Meaty. 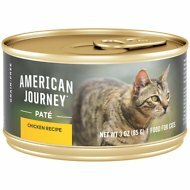 Our kitten loves this product, when she hears me open the can, she starts to meow and crawl up my leg. I have two 6 month old siblings. They've been on this most of their lives. Only food I found that they will both eat and eat it all. Their coats are so soft and shiny and they're both growing so big and strong! Definitely recommend. I have one VERY finicky Bengal kitten, and from the description I expected less pate, more chunky. He doesn't like pate. Happily, there are 10 other cats here waiting for adoption who will eat it. My new kitties chow a can each down, faster than I can rinse the spoon at the sink. Love it.